Sine Tempore elegant and modern structure furnished traditionally with modern comfort, present in every room with high standards to satify the guests. The apartments Paestum and Pompeii, on the first floor of a recently refurbished building (2007), are independent but contiguous. Each apartment is 50 square and includes a large living room with sofa bed and a TV Sat, a kitchenette with their tools, a bathroom with shower and a bedroom with double bed. Both apartments are equipped with central heating, air conditioning, terrace-solarium and they are also accessible via a lift. Each apartment can accommodate up to a maximum of four people including smoking, handicapped and children. 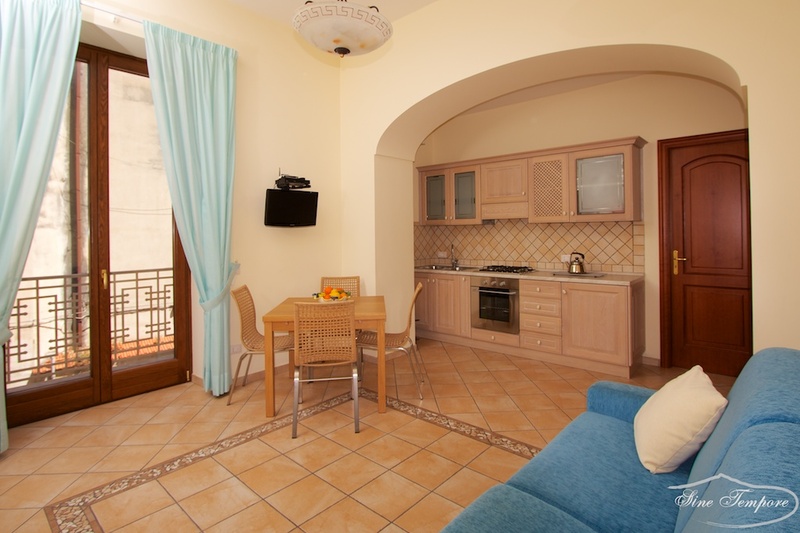 The apartment Paestum overlooks the main street offering a panoramic view; so great for days spent outdoors to observe the “Sorrento walking”. The apartment Pompeii is instead within the building and has a large terrace-solarium; so good to spend some days of perfect peace and tranquillity. Is the chaos of modern living getting to you? Escape to the heart of Sorrento, with its stimulating culture, fine art, deliciously tempting food and spectacular scenary.